Results: Today's climate models regard organic aerosols as static carbon-based molecules, but scientists at Pacific Northwest National Laboratory and the University of California, Irvine showed that the particles are very dynamic. Exposure to sunlight transforms the aerosol composition drastically. Changing the composition alters how the particles behave, a topic of interest to scientists and climate modelers. 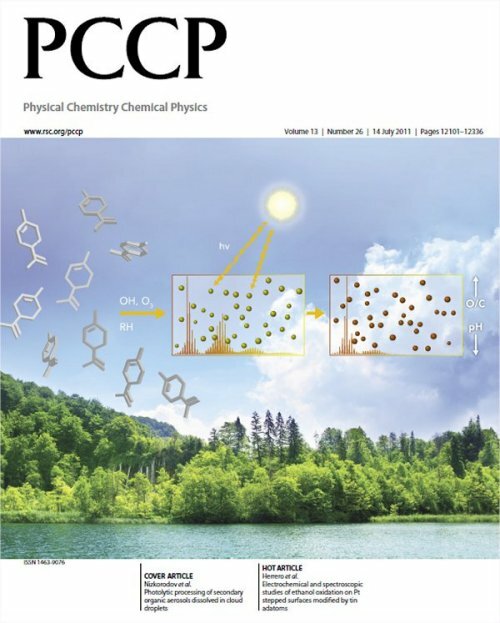 Artwork from this study graced the cover of Physical Chemistry Chemical Physics. 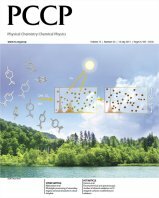 Why It Matters: Current atmospheric computer models do not consider the evolving chemistry of the organic aerosols. However, small changes in the chemical composition of particles can affect the environment. For example, sunlight bleaches the brown particles white, reducing the amount of heat the particles absorb. When considered on a global scale, a change in heat absorption could have major impacts. By considering the chemical changes, scientists can fine tune atmospheric models, allowing them to better simulate the effects of environmental and regulatory changes. "We are interested in understanding how sunlight affects the chemical composition of organic particles," said Dr. Adam Bateman, who worked on this and other global change studies. Bateman is a recent graduate of UCI and was a Department of Energy Global Change Education Program fellow. Methods: In a series of experiments, the team synthesized organic aerosols. The carbon-packed constituents are ubiquitous in airborne particulates, coming from sources as diverse as pine trees and diesel trucks. "Many modeling efforts assume that once the particles are emitted, their properties don't change as a function of time," said Dr. Alexander Laskin, a physical chemist at PNNL. "It is not that people don't realize that particles evolve. You just have to keep it simple." The team exposed the particles to light that mimics the range of energy found in sunlight. Using high-resolution mass spectrometers at EMSL, the scientists analyzed the samples of particles. They found that the sunlight changes the chemical structure and physical properties of the particles. For example, the light can destroy relatively large organic or carbon-centric molecules, chopping them into smaller pieces. These chemical changes alter light-absorbing properties of the organic material. "We found that exposing particles to sunlight makes the particles increasingly more oxidized and acidic, which in turn makes it easier for such particles to nucleate water and make cloud droplets," said Professor Sergey Nizkorodov, a physical chemist at UCI who led the study. The optical properties of the particles also change. Specifically, the light causes the particles to fade and become less light absorbing. When freshly prepared, particles absorb some light, but as the particles fade, they absorb significantly less. This study further highlights the complexity and dynamic nature of atmospheric particles that may have a significant effect on the environment. What's next? The researchers at PNNL and UCI are continuing to answer questions about the properties of organic aerosols in the atmosphere. They are working to understand how the aerosols change their physical properties when exposed to different environmental conditions and the ensuing chemical reactions. Acknowledgments: The research was funded by the National Science Foundation, DOE's Global Change Education Program, and intramural research and development program at EMSL. This research was done by Adam Bateman and Sergey Nizkorodov of University of California, Irvine, and Julia Laskin and Alexander Laskin at PNNL. The research was done at the Environmental Molecular Sciences Laboratory, a national scientific user facility.